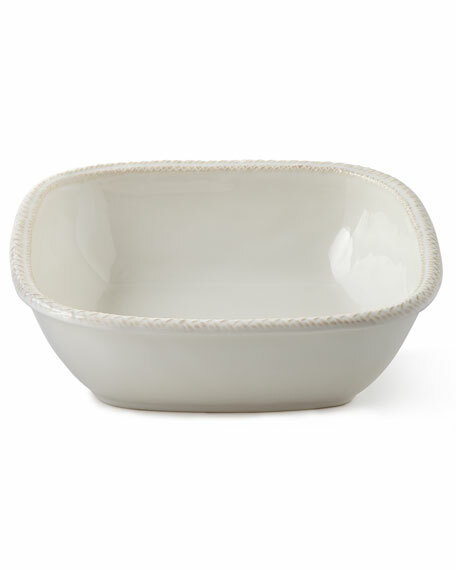 Serving bowl made of ceramic stoneware. 11"Sq. x 3.25"T; holds 3 quarts. Silver-plated multipurpose bowl. Designed by Andree Putman. 5.5"Dia. x 2.5"T. Comes with anti-tarnish-treated felt storage bag. Made in France. Marble serving board. Aluminum stand with two glass bowls. Hand-painted gold leaf details. Each bowl holds 10 ounces. 19"W x 10"D x 14.1"T. Hand wash. Imported. Pineapple-shaped punch bowl crafted of nickel plate. 14.5"Dia. x 16"T. Holds 2 gallons. No ladle included. Hand wash. Imported. Hand-painted extra-large Talavera serving scalloped edged bowl with handles. 24" x 19" x 9". Hand wash. Imported.